These Vintage Threads Are 30,000 Years Old Archaeologists digging in a cave in the republic of Georgia have come across the world's oldest textiles. Dyed pink, turquoise and other colors, these flax fibers may have helped our ancestors survive the last ice age. Archaeologists digging in a cave in the Eurasian country of Georgia have come across the world's oldest textiles: flax fibers that date back 30,000 years or more. The find suggests that string isn't as humble as it seems. It may have helped our ancestors survive the last ice age. A more than 30,000-year-old dyed flax fiber found in Georgia. It's likely that early humans used plants in the area to color the fibers. To get a picture of life back then, scientists look at pollen from caves to figure out what plants were around when the people were. 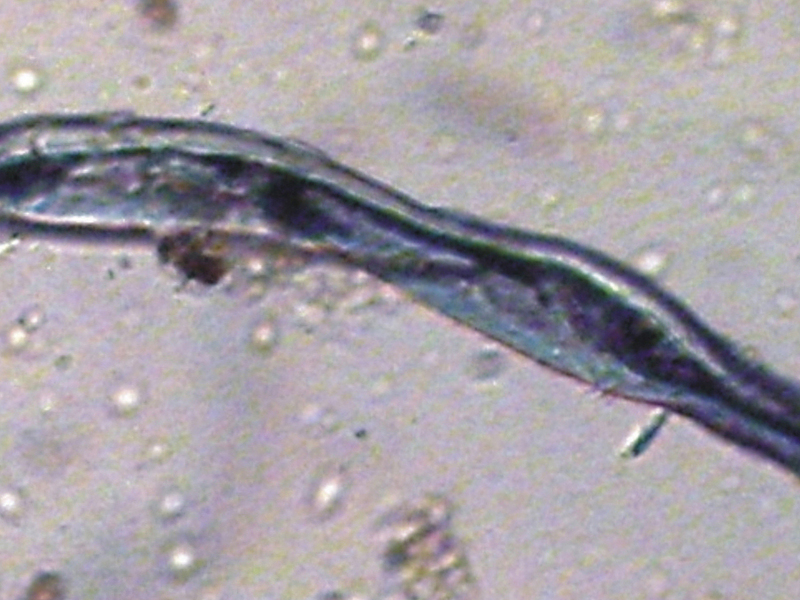 Ofer Bar-Yosef, a Harvard archaeologist, says a colleague of his studied some cave pollen under a microscope. "Her major discovery was that many of these pollen chambers actually contain fibers of flax," he says. 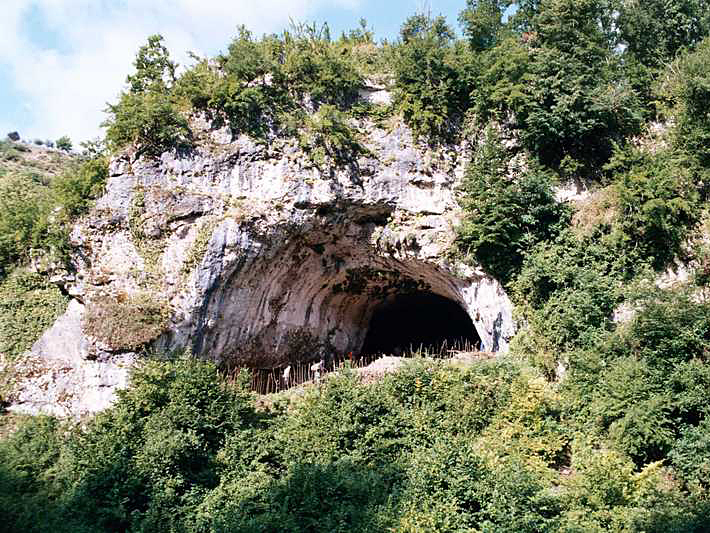 An outside view of the Dzudzuana cave, where archaeologists discovered the fibers. Flax was growing wild at the time. And it turns out not only to be a source of edible grain, but of fiber. These fibers were twisted — a sure sign that the flax had been spun. Flax fibers woven together make linen, but in this case, linen doesn't mean crisply pressed summer suits. Bar-Yosef says the fibers they found in the cave were probably braided together, macrame style. "You can make headgear, you can make baskets, you can make ropes and strings, and so on," he says. Bar-Yosef didn't find any of those objects in the cave — that's too much to hope for 30,000 years later. But the researchers report in Science magazine that they did find evidence that the fibers were knotted and dyed — black, gray, turquoise and even pink. That's consistent with other artifacts that show an artistic flair among these early people. The news of this ancient textile is exciting to Elizabeth Barber, a retired professor from Occidental College in Los Angeles. She literally wrote the book on prehistoric textiles. "I mean, talk about the proverbial needle in the haystack," she says. "Trying to find fibers that are 30,000 years old really is almost impossible." Barber says evidence of textiles already dates back 25,000 years — there are impressions of woven material found in clay. It's now clear that the technology is even older. And that fits nicely with her hypothesis that plain old string was a powerful technology, which helped people weather the last ice age. "It totally revolutionized what they could do," she says. "On a very simple basis, think of the fact you can tie things up in packages so you can carry more. You can put out nets and snares to catch more game so you can eat better." We tend to think of clothing when we think of woven materials. But Barber says woven clothing was probably not around 30,000 years ago. "There's no real evidence they wore clothing," she says. Figurines and other representations usually showed people naked. "If you were cold, you'd pull the pelt that came off of last night's dinner around your shoulders." Instead, she says, woven clothing evolved not so much for comfort as for fashion — and it was fashion with a social purpose. "It's not until you start to get haves and have-nots that people start differentiating themselves by, 'Look what I'm wearing as opposed to what you're wearing or not wearing.' "
So how does she explain the pink and turquoise dyes on those ancient fibers? "We love color — our brains go 'zing' when they see color," she says.